We’d love your help. 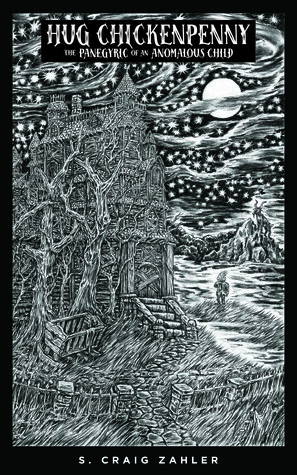 Let us know what’s wrong with this preview of Hug Chickenpenny by S. Craig Zahler. To ask other readers questions about Hug Chickenpenny, please sign up. Kind of an abrupt ending, but still enjoyable. Sad and fun. Very bizarre. Think BIG FISH and Lemony Snicket and THE ELEPHANT MAN. While Hug Chickenpenny: The Panegyric of an Anomalous Child is not something I'd normally read and had me reaching for the dictionary more than once, it's one of those books that I know will stay with me for a long, long time. Zahler's work will do that. Like his damning westerns Wraiths of the Broken Land and A Congregation of Jackals (ironically enough, the western is another genre I've never read before those), Hug Chickenpenny is much more than literature. It's an experience. You can read my While Hug Chickenpenny: The Panegyric of an Anomalous Child is not something I'd normally read and had me reaching for the dictionary more than once, it's one of those books that I know will stay with me for a long, long time. Zahler's work will do that. Like his damning westerns Wraiths of the Broken Land and A Congregation of Jackals (ironically enough, the western is another genre I've never read before those), Hug Chickenpenny is much more than literature. It's an experience. Where to begin with this book? Hug Chickenpenny: The Panegyric of an Anomalous Child is unlike anything that I've read before. It's a coming of age story, but with a fantasy bent that makes it completely unique. I can promise that whatever you think you're going to find in these pages you're, at most, only about half right. If you've seen Bone Tomahawk, you might have a general idea about the brilliant oddness that Zahler can create. Just go into this book with an open mind, and prepare yourself Where to begin with this book? Hug Chickenpenny: The Panegyric of an Anomalous Child is unlike anything that I've read before. It's a coming of age story, but with a fantasy bent that makes it completely unique. I can promise that whatever you think you're going to find in these pages you're, at most, only about half right. If you've seen Bone Tomahawk, you might have a general idea about the brilliant oddness that Zahler can create. Just go into this book with an open mind, and prepare yourself for an anomalous journey. As a character, Hug Chickenpenny wins the award for the quickest I've ever grown attached to anyone. From the moment of Hug's unusual entry into the world, the reader is shown how much he has stacked against him. See, Hug isn't exactly a "normal" child. In the broadest sense of the word, he's quite different. Which of course then sets the stage for his rather rough, and equally intriguing, childhood. Hug's ability to see the good in people and situations, that I would be railing madly at, is really what endeared him to me. No matter how dark things became, Hug was always a ray of light and that is really the most beautiful part of this book. In terms of plot, there's not a lot that I can say without spoiling things so I'll tread carefully. To say that Hug's story is interesting is actually somewhat of an understatement. Hug probably goes through more in the duration of this book than most of us do in a lifetime. Poor thing. I loved the characters that S. Craig Zahler brought into his path, and especially appreciated those who could see past Hug's outer "otherness". However the book started to lose me somewhere around the mid-point, when it strayed too far into the fantasy aspect of everything. I liken it to following a steady trail of breadcrumbs into a forest, only to find halfway through that it had been entirely eaten by birds. I was left wandering towards the ending, which then came rushing up too quickly. I almost felt a bit cheated overall. Especially because, in the vein of Lemony Snickett, so many sad things had happened so close together at the end. I lacked closure, and that wasn't something I enjoyed. The whole time I was reading this book, I kept thinking, this is a great story (a beautiful story, even) that is, unfortunately, told by the wrong person. Zahler tries too hard to be or sound Dickensian; it doesn't work. He tries too hard to sound sophisticated; it doesn't work. He can't handle the complexity and nuance it would take to tell this story the way it deserves to be told. It was okay. I enjoyed it. I wouldn't read it again, nor would I recommend it someone who is looking for a good r The whole time I was reading this book, I kept thinking, this is a great story (a beautiful story, even) that is, unfortunately, told by the wrong person. Zahler tries too hard to be or sound Dickensian; it doesn't work. He tries too hard to sound sophisticated; it doesn't work. He can't handle the complexity and nuance it would take to tell this story the way it deserves to be told. It was okay. I enjoyed it. I wouldn't read it again, nor would I recommend it someone who is looking for a good read. It had too many pointless scenes, too much needless dialogue, WAY too many uses of "viridescent," "opalescent," and any form of the verb "to amble." One character is characterized by his supposed vast and advanced vocabulary, but even he is repetitive and comes off sounding like a teenager who uses a thesaurus when writing an essay, using words that just don't feel like they fit and are "advanced" only for the sake of being advanced. I asked myself several times, "Is this on purpose? Is this character meant to sound pompous and fake?" Based on the language use in the narrative itself (which one can see just from the title of the book) I decided that this was not the case: the character is supposed to be a genius and he fails at being presented that way. Ultimately, even though I feel bad for the "anomalous child," he never felt real to me, due to the writer's over reliance on Hug's physical appearance and spending not nearly enough time on Hug's personality, thoughts, etc. You remember that episode of friends where Monica and Chandler have Joey write them a letter of recommendation and Joey over-uses the thesaurus to try and sound smart? That’s basically how this book reads...but it’s good. Very rarely am I ever hooked on a book from the first chapter, but this one got me and kept me entertained the entire way through. The story of orphan Hug Chickenpenny is both funny and tragic, which is an incredible balance to keep. It’s almost Tim Burton-esque, but the author d You remember that episode of friends where Monica and Chandler have Joey write them a letter of recommendation and Joey over-uses the thesaurus to try and sound smart? That’s basically how this book reads...but it’s good. At present, I will tell you that you will love the anomalous boy and his story. You will achieve the full range of the emotional experience, never knowing who to love or hate or laugh or scowl at. Unique and intriguing. If Tim Burton and Mervyn Peake got together to update one of Dickens' orphan novels ... it would probably look something like this. Unlike any of his previous works, S. Craig Zahler tells the heartbreaking story of Hug Chickenpenny in the vein of classic Tim Burton. This is a pretty straightforward tale that comes to life through colorful dialogue. This novel further cements the fact that S. Craig Zahler is a master storyteller by venturing and excelling in different genres than he has established himself in. I recommend this book if you enjoyed the following: Edward Scissorhands, Big Fish, Miss Peregrine's Home for Peculiar Unlike any of his previous works, S. Craig Zahler tells the heartbreaking story of Hug Chickenpenny in the vein of classic Tim Burton. This is a pretty straightforward tale that comes to life through colorful dialogue. This novel further cements the fact that S. Craig Zahler is a master storyteller by venturing and excelling in different genres than he has established himself in. Welp, I read this in two days and it just entered my all-time favorite works of fiction. Thanks for the amazing recommendation, Meag! Zahler u nás zabodoval skvělou kriminálkou Špinavý kšefty na North Ganson Street (a samozřejmě, podobně brutálním filmovým westernem Bone Tomahawk), takže když mi nakladatelství Mystery Press nabídlo, jestli si nechci přečíst jeho román Hug Chickepenny, jestli by se nehodil pro vydání, samozřejmě jsem po tom hned hrábnul. Ale nakonec to bylo trochu komplikovanější. Je to dobrá knížka? To ano. Je dobře napsaná? Rozhodně. Je tedy k vydání? No... nejsem si jist. Hlavní potíž je v tématu. Není to an Zahler u nás zabodoval skvělou kriminálkou Špinavý kšefty na North Ganson Street (a samozřejmě, podobně brutálním filmovým westernem Bone Tomahawk), takže když mi nakladatelství Mystery Press nabídlo, jestli si nechci přečíst jeho román Hug Chickepenny, jestli by se nehodil pro vydání, samozřejmě jsem po tom hned hrábnul. Hlavní potíž je v tématu. Není to ani hororový western ani hororová kriminálka. Je to... Sloní muž mixovaný s Oliverem Twistem, to celé zasazené do současnosti. Celé to začíná zrozením jmenovaného Huga, který je, slušně řečeno, monstrum. Co může být pokřivené, to je. Každá ruka, noha i oko jsou jiné a když křičí, praskají okenní tabulky. Jeho matka porod nepřežije a tak skončí mílý Hug v děcáku, kde stráví větší část svého života - s kratšími či delšími odskoky do různých rodin. Od šíleného vědce až po majitelky galerie. Mezitím pomalu vyrůstá v inteligentního, ale pořád obludného kluka, který má jediný sen - postavit si raketu a vypadnout z téhle zatracené planety. Do vesmíru, odkud určitě přišel. Brilliant coming-of-age/quest novel with a marvelous hero, written by the director of Bone Tomahawk, this is a quite different, but no less amazing story. Highly recommended. Hug Chickenpenny: The Panegyric of an Anomalous Child by S. Craig Zahler is a wonderfully bizarre but heartbreaking tale filled to the brim with symbolism. This is one that you should not read alone! Trust me. You're going to want to talk about it! I'm so glad that this was the book pick for my work book club. We had such an amazing conversation about it. Phew, what a read this was! No matter how long I've tried to organize my thoughts... I just keep wanting to type out the same things; this is de Hug Chickenpenny: The Panegyric of an Anomalous Child by S. Craig Zahler is a wonderfully bizarre but heartbreaking tale filled to the brim with symbolism. Phew, what a read this was! No matter how long I've tried to organize my thoughts... I just keep wanting to type out the same things; this is definitely a very unique tale! So my apologies, my thoughts below are quite choppy! Hug is such an amazing character! I couldn't move forward with this review without shouting that out! He is a character that I know will stick with me for a long time to come. Hug was so unique and otherworldly. Right from the synopsis you can tell that he doesn't have an easy life. But no matter what was thrown his way, he remained hopeful and positive. Needless to say, he was a character that I really rooted for! And I just loved that he went around saying, "Don't be mean." I don't want to dive into all of the symbolism and spoil things, but I will say that my favorite element was the amethyst. During our book club chat, I looked up what amethyst has symbolized throughout history, and each explanation totally fit into to the story! There were also elements added into the tale that seemed wildly inappropriate, but created wonderful talking points! Saying that I "enjoyed" this book doesn't really fit. I started out very confused and from there, things got more and more peculiar as the events of Hug's life unfolded. Some of the situations he was forced into made me cringe or got my blood boiling. Other situations were very strange. But some were enjoyable and quite lovely! My two main complaints are centered around repetition and flow. The writing was a bit repetitive at times, though it did seem to be done on purpose. It's just my usual reading irk! As for the organization of the storyline, it just felt so choppy, especially in the beginning as Hug grew up. I found it really difficult to gauge how much time had passed. Floorboards slammed into her left hip and outstretched palms. For a moment, the dull thud of her arrival echoed throughout the library. This was such a quick read! It's definitely one to read over a weekend because you won't want to put it down. While I didn't really enjoy it, per say, I do definitely appreciate the story and I can see myself re-reading it for sure! This was such an addictive read! Odd, unusual, heartbreaking, and heart-mending, with every turn of the page you just don't know where you'll end up on the emotional spectrum, but you just can't put it down. There were characters to love, loathe, believe in, trust, grow to understand, and then some. The circumstances in which we meet each tends to bend our initial opinion of them, but their true colors win out every time. While I adored it on the whole, it wasn't without points for improvement. This was such an addictive read! Odd, unusual, heartbreaking, and heart-mending, with every turn of the page you just don't know where you'll end up on the emotional spectrum, but you just can't put it down. There were characters to love, loathe, believe in, trust, grow to understand, and then some. The circumstances in which we meet each tends to bend our initial opinion of them, but their true colors win out every time. While I adored it on the whole, it wasn't without points for improvement. For example, there are holes in the timeline as Hug ages, there's the introduction of characters that simply disappear, and then the situations/scenes that seem pretty significant, yet either don't go anywhere, or are over in a moment's time. There was just SO MUCH MORE I wanted to know. Perhaps it was the author's intent to let readers draw their own conclusions, but I was just so close to Hug that I wanted something more concrete to hold on to. In the end, I ADORED THIS BOOK! It's unusual, strange, odd, but full of so much truth and heart that it hurts...no really, it does. That ending about tore my soul up. I was finishing it in a restaurant at the time with my parents, and just starting crying. Sure, I drew the attention of others, but did I care? Nope...not a bit. Those tears were for Hug and I regret not a one. So, if you like a bit of the beyond belief with your reality, grab this Fantasy Fiction title post haste...but be prepared for the feels, because you'll be all over the page and then some. This was a very quick read, because I couldn't put it down once I started. The circumstances of Hug's birth and parentage are mysterious to say the least, and his life is filled with people who don't understand him. Born to a mother who died upon birthing him, Hug (as he is so named in his orphanage home) is small, malformed, and just plain different. There are some in his life that want the best for him, though, and Hug's story is told through these stages of his life where people cared for him This was a very quick read, because I couldn't put it down once I started. The circumstances of Hug's birth and parentage are mysterious to say the least, and his life is filled with people who don't understand him. Born to a mother who died upon birthing him, Hug (as he is so named in his orphanage home) is small, malformed, and just plain different. There are some in his life that want the best for him, though, and Hug's story is told through these stages of his life where people cared for him. Hug Chickenpenny is a boy who knows he's different, but doesn't ask why. He takes his lot in life and does the best he can with it. He's smart, kind, and always tries to see the best in people, even when these people don't see what's good in him. I loved it best when Hug was able to interact with children his own age; he is not only different from these kids physically, but he is mentally and emotionally more mature and it's interesting to see how his presence affects others. Children, of course, are the most adaptable when finding something abnormal, and Hug can see himself through these children's eyes and realize why he might make others react the way they do. He is 5 books for 5 now which makes me even more excited to see what he's gonna do in film. Anyway, this is 264 pages and I would say it could've been longer, more like 300. Now, I never grew up with Snicket but I feel Chickenpenny encompasses that vibe but written in a way that at my age I could enjoy. Reading Snicket now is troublesome and cumbersome for me. Beyond that things could've been fleshed out even more with characters and that world, I really enjoyed this. The origin of He did it again. The origin of how he came to be and the life that he led was an enjoyable read. I loved how a lot of stuff about Hug wasn't explained. It didn't need to explained, who cares about the whole amethyst stuff. Though, more time with the other characters would've been nice. With the time we had though, the lingered enough to have an impact. Rex was a surprise. Which just proves how hopeless Hug has been throughout the entire book until that change. I enjoyed that and now as I write this, I would say if things were more fleshed out it may have taken out the 'umph' of these characters who merely lingered but lingered just enough. Anyway, it was such a change of pace and narrative from what Zahler has written before that I was really curious how this book would go and I say he did it again. This review has been hidden because it contains spoilers. To view it, click here. I was initially put off by the author's use cumbersome use of vocabulary. This later makes more sense as Hug's character is more understood and with the introduction of another character. Halfway through the book the I was emotionally invested and had a difficult time putting the book down. The book makes an excellent point of how society views beauty and treats those that don't fall in line with the normal social definitions of beauty, physical appearances, and states of normality. The reader w I was initially put off by the author's use cumbersome use of vocabulary. This later makes more sense as Hug's character is more understood and with the introduction of another character. Halfway through the book the I was emotionally invested and had a difficult time putting the book down. The book makes an excellent point of how society views beauty and treats those that don't fall in line with the normal social definitions of beauty, physical appearances, and states of normality. The reader will finish with a new perspective and appreciation of folks that are different from themselves. The ending was superb mix of emotions. Happiness and thankfulness for Hug finally getting what he desired most. Sadness for the manner in which he received it. Joy at being reunited with his parents and sorrow at their losses. I was thrilled when George was able to see him one last time and they were able to share a moment over the source of his name. If you like the movie The Grand Budapest Hotel, you may like this book. But keep in mind that this is in regards to the writing (or narrating) style, NOT the content. Hug Chickenpenny is written in such an interesting style that the comparison to the Grand Budapest Hotel is the first thing that popped into my head, even though the stories told by each are nothing at all alike. I had only picked this up at the library on my way out with a CJ Box book that I like for easy reading. I usually pick u If you like the movie The Grand Budapest Hotel, you may like this book. But keep in mind that this is in regards to the writing (or narrating) style, NOT the content. Hug Chickenpenny is written in such an interesting style that the comparison to the Grand Budapest Hotel is the first thing that popped into my head, even though the stories told by each are nothing at all alike. I had only picked this up at the library on my way out with a CJ Box book that I like for easy reading. I usually pick up a random book and have to say Hug is one of the best I've ever read from this "grab-and-go" option. In fact, this may be one of the best written books I have ever read. I knew nothing about it and did not know what to expect. As you first start reading you're not sure if this is a horror, thriller, mystery, and after having finished it I am still not sure what category this book fits in, maybe drama, maybe even fantasy. After reading S Craig Zahler's Wraiths of the Broken Land and Corpus Chrome Inc the story of Hug Chickenpenny is a departure from what I had been used to. Following the plight of the anomalous Hug as he has to carry on through his young life with all manner of disadvantages and falls foul of the prejudices of those around him, it is clear from the start that this is no ordinary child and his path is never going to be the easiest one. Taking a more focused direction than his previous, multi-charact After reading S Craig Zahler's Wraiths of the Broken Land and Corpus Chrome Inc the story of Hug Chickenpenny is a departure from what I had been used to. Taking a more focused direction than his previous, multi-charactered novels is a welcome change and I thought that it handles this well without every really drawing me in. Some interesting asides appear and never reappear, leaving a certain level of questioning as to why they were worked into the story in the first place. I don't know where to start. This book is pure fun. Hug Chickenpenny will delight and resonate with readers long after the last page has been read! The story just kept getting better and better the further that I got into it. So many intriguing characters. Hug may have been the leading star of the story but not without some friendly help. There is George (Georgie) the caretaker and the one that gave Hug his name as well as Abigail and her family, which was actually Hug's family as well. Well the I don't know where to start. This book is pure fun. Hug Chickenpenny will delight and resonate with readers long after the last page has been read! The story just kept getting better and better the further that I got into it. So many intriguing characters. Hug may have been the leading star of the story but not without some friendly help. There is George (Georgie) the caretaker and the one that gave Hug his name as well as Abigail and her family, which was actually Hug's family as well. Well the only family that Hug truly knew. Could be read as a parable and/or a commentary on how we deal with illness, physical disability, and abuse on both personal and social scales. It's a life affirming magical realism tale centered on a Christ-figure child persevering through a grotesque and abusive world. The prose is all over the place. Unnecessary use of many obscure words, the noun phrases for each character are repeated excessively, and most of the imagery and action is delivered through some strange syntax. The story, characte Could be read as a parable and/or a commentary on how we deal with illness, physical disability, and abuse on both personal and social scales. It's a life affirming magical realism tale centered on a Christ-figure child persevering through a grotesque and abusive world. The prose is all over the place. Unnecessary use of many obscure words, the noun phrases for each character are repeated excessively, and most of the imagery and action is delivered through some strange syntax. The story, characters, varied tones, and world building are totally engrossing, though. Zahler delivers a careful balance of satiric humor, endearing characters and moments, heart-wrenching events, and exciting action sequences, all in a uniquely drawn, grotesque, expressionist world. I loved this book so much. I’ll be honest, I have not been reading nearly as much as I have been in the past, and despite me wanting to, I really haven’t. When I first read about this book, I was instantly intrigued by it, and I instantly wanted to read it, and I’m really glad I did. I prefer books that are constantly interesting and engaging, or at the very least, I prefer them while I am trying to get back into reading, and this book remained interesting the entire time I was reading it. Not t I loved this book so much. I’ll be honest, I have not been reading nearly as much as I have been in the past, and despite me wanting to, I really haven’t. When I first read about this book, I was instantly intrigued by it, and I instantly wanted to read it, and I’m really glad I did. I prefer books that are constantly interesting and engaging, or at the very least, I prefer them while I am trying to get back into reading, and this book remained interesting the entire time I was reading it. Not to mention I loved learning new words while reading it, and since I live to write, it was amazing to learn all of these new and interesting words. I hope someone finds this helpful, but I really enjoyed reading it, and I hope other people do too! I received this book as a goodreads giveaway in exchange for an honest review. Hug Chickenpenny is an anomalous child, and this is an anomalous book. That being said, I fell in love with Hug and his world. It's a wonderful combination of fantastical, outlandish, heart-wrenching, and thoughtful. Read this story with an open heart and an open mind.....and maybe a couple of tissues on the side. Highly recommend. An entertaining, tear jerking parable? Poor Hug is so "anomalous" as to be almost grotesque. From the age of about 7 he returns good thoughts for cruel actions. Book is well written entertainment, but bears as much likeness to real life as the number of times you have used "anomalous" and "panegyric" in the same sentence. An entertaining feel good book well deserving of being a good read. The first chapter was awkward and ugly and I didn't get it right away. By the end of the third chapter I felt like a fool. The protagonist is awkward and ugly and no one gets him right away, and by the end... This story, which is absurdist and confusing and alarming, is going to inform my heart forever. I had to dissect my feelings when I finished this. I have to say that I enjoyed it. I don't ready very many character-driven novels, so at times this was kind of slow for me. However, it was interesting to follow Hug's life and see how he impacted the people around him. There are a couple of questions that I did not get answers to, and I wanted to know more about Meredith. Maybe a 3.5? I don't know... this one was really hard to rate. There were various editing issues which are hopefully just because I had an ARC. Many parts bothered me or made me uncomfortable, but I think that was intentional. Overall it's a touching if utterly odd tale.... a good choice for fans of Neil Gaiman.